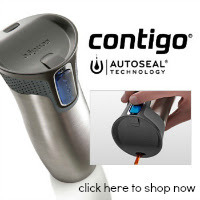 Save almost $2.00 on the already low priced Contigo travel mugs from Cross Country Cafe. But, these mugs aren’t even about price, they are simply THE highest quality travel mug you can find. The best part is, they come in a variety of beautiful colors! Next articleAre You Wearing The Right Shoes For Your Outdoor Activities?